"It was an incident that scarred the whole tournament and our memories of one of the greatest players in the modern game." As the preeminent sporting event on the planet, soccer's World Cup brings great expectations from the literally billions who view it every four years. Unfortunately, those expectations rarely come to pass. The 2006 edition of the tournament saw Italy win the trophy after a penalty shootout with France, but the most notable aspect of an otherwise dull game was France's Zinedine Zidane, one of the most gifted players to ever grace the game, end his career with an ignominious headbutt on Italian centerback Marco Matterazzi. The bizarre incident will remain the centerpiece of an otherwise mediocre tournament, filled with too much cheating and boring football to be considered an aesthetic success. 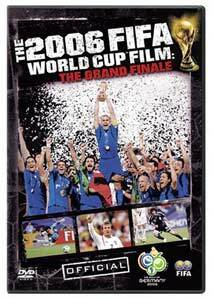 FIFA, soccer's ruling body, has issued their official film about the tournament, featuring the evocative title The FIFA World Cup 2006 Official Film: The Grand Finale. It simply flows off the tongue, does it not? Narrated by Pierce Brosnan and directed by Michael Apted, it at least has some quality people involved, and makes for an entertaining recap, if hamstrung by its own official status to really get into the issues at the heart of the tournament. The film takes a haphazard selection of the games from the group stages, ignoring some good games and highlighting truly dismal ones (England v. Trinidad & Tobago, anyone? Why force us to re-live that dog?). The action is mostly seen from field level cameras, with low-key and minimal narration from Brosnan; the editing is smooth and the soundtrack is basically the crowd noise for each game, which makes for a nice change from the usual announcer's blather. The film is not without its moments of wit; the dreadful (or brilliant, depending on your viewpoint) match between Portugal and the Netherlands, featuring two teams of cynical cheats that racked up a ridiculous 16 yellow cards and 4 reds between them is one featured match here, with a ticker in the upper right corner counting off each card. Comedy gold, to be sure. Likewise, Argentina's 26-pass goal against the hapless Serbia-Montenegro squad gets a counter as well, though the pathetic defending makes it less of an achievement than some have made it out to be. Argentina's truly spectacular goal (and game) against Mexico doesn't get a look-in, though. More stupidity is highlighted in the England-Portgual match in the quarterfinals; England was one of the worst teams of the tournament to watch, with smug, self-satisfied players coached by the clueless Sven-Goren Eriksson, who picked his team badly, couldn't settle on tactics, and couldn't make the best use of the players he did select. When England striker Wayne Rooney found himself red carded for his moronic stomp on the crotch of Portugal's Ricardo Carvalho, it may as well have sealed England's fate there, what with Rooney, not fully match fit due to an early return from a broken foot, being their only real threat to make something happen at any time. Watching the English team crumble once again during penalty kicks would have been more enjoyable if it didn't mean Portugal advanced. The bulk of the second half focuses on the semi-final matches and the final, obviously, which featured one good match out of three in the excellent Italy-Germany semi-final. In the other semi, France refrained from any crotch-stomping in sweating out a 1-0 win over the Portuguese. The final between France's aging greats (several of the 1998 World Cup-winning squad remained) and the Italians, many of whom were reeling from a burgeoning corruption scandal in the Italian domestic game, promised a juicy game, but for the most part it didn't happen. France went ahead after 7 minutes with a Zidane penalty before Matterazzi equalized for the Italians. The game slogged its way to extra time, when Zidane went temporarily berserk with that regrettable headbutt. It inevitably went to penalties, a terrible if nerve-wracking way to end a game, and the Italians held their nerve better than the French, earning their fourth World Cup title. Rather enjoyably, the film is free of time-wasting interviews, leaving just about everything on the field where it belongs. I would have selected different games and highlights, but what's here remains entertaining enough and worth a look for any soccer fan. If you like the NFL Films style of filmmaking, this is in that vein, mostly free of the self-mythologizing the NFL indulges in so well. Image Transfer Review: Presented in 1.78:1 anamorphic widescreen, the HD footage shot for this documentary is excellent, crystal clear and colorful. Much of the game footage is from cameras at field level, so the action is close up and detailed. Audio Transfer Review: Strangely, we are only provided with Dolby 2.0 mixes, but they sound quite fine. Much of the soundtrack is dedicated to crowd noise, so a surround track would have been nice for that immersing touch. Extras Review: A bit disappointingly, the only extras are several interviews with participants in the tournament; something like a reel of all the goals scored seems like an easy extra to put together and would have been a welcome addition. Anyway, the interviews are as follows: Ivory Coast's Didier Drogba (05m:02s); referee Horacio Elizondo (06m:19s); France's Thierry Henry (08m:28s); Germany's Jens Lehmann (09m:35s) and Michael Ballack (06m:21s); Japan's Hidetoshi Nakata (04m:18s); and Italy's Fabio Canavarro (07m:40s). The interviews were shot in a variety of locations and are subtitled where necessary. The topics range from backgrounds in football to the actual tournament itself, and make for a decent viewing. Four trailers are thrown on as well. As a wrap-up film, this is well put together, and entertaining enough in its own right. The use of on-field, HD footage allows for superb video quality. The main downside is the various great moments that were left out. Still, if you enjoyed the tournament, and you like NFL Films-styled documentaries, this will be of interest.